Ah! Here he is now! I'll just let you eavesdrop on our IM session. WM: captain spitcurl! what's going on? DH: spitcurl - nice. just checking in, seeing if you're ready for the movie. WM: oh yeah, i'm psyched! i've watched it 3 times this week alone. DH: dude. what? are you talking about. we're watching the devils's backbone. WM: the devil's backbone? what, is that like a sequel or some fan fiction or something? how did i miss that? i troll the boards. DH: i feel like you're talking about The Thing again, in which case you run the boards. WM: the boards. i know of the boards. i might be on the boards. post from time to time. chat. small talk. rob bottin. WM: ok, yeah, i run the boards. and i have no idea what you're talking about. 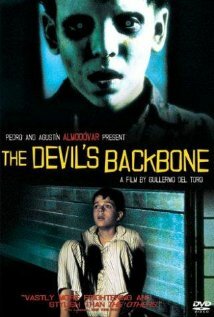 DH: the devil's backbone, you know, guillermo del toro's spooky yet politic meditation on the spanish civil war as seen through the lens of a superstitious orphan, dealing with loss, grief, abandonment, sexuality, ghosts, the sword of damacles and the long walk home: the devil's backbone. WM: wait, what? i thought we were doing The Thing. finally? DH: i was very clear we're not doing The Thing this year. despite the fact the prequel coincides with return of project horror. WM: but what about the fact that the prequel coincides with return of pro...oh. DH: and despite the fact that it is the single scariest movie streaming on netflix. WM: but it's the single scariest movie stre...mmm. DH: and, most of all, the omission is not an affront to the fact that it was the first R-rated movie that your father ever took you to see. at 12. WM: but i was 12 when the major...i see. DH: you know if you're not even going to pay me the respect of staying on topic i don't have time for this. i have a wife and kids and...in 'n out burger you say? DH: just whenever you want it, because you just want it? DH: ok, so let's put a pin in this "Thing" thing until tomorrow. i've gotta run, catch you later. I warned y'all about Will before, right? He really likes The Thing. I guess I'm taking this one by myself. The Devil's Backbone is another Guillermo del Toro movie (you may remember that Cronos, which I watched earlier this month, was, too). It is simultaneously a ghost story, and not really a ghost story at all. This month is catching up to me. I'm having to chug coffee to stay awake at work, and I'm neglecting the gym to stay home and watch movies. That's OK, just a few more days. I'm afraid I may not do this movie full justice tonight, but I'm going to do my best. Carlos is an orphan who is taken in at a boys' orphanage in Spain, during the Spanish Civil War. He is targeted by the school bully, but soon becomes more worried by glimpses of a ghost around the school, a young boy just like him. He sets out to learn more about the boy's history, what happened to him, and why the school bully denies believing in the ghost. When the boys find out why the ghost is at their school, and the danger that it also places them in, they act to avenge his death and free his spirit. Mr. del Toro. Guillermo. Billy. Nicely done. As I started watching this, I thought it was going to be a standard haunted house thriller, maybe with some Sixth Sense influences. It definitely delivered on the spookiness front. Even in scenes where I kind of knew what was coming (like when Carlos was peeking through the keyhole), you delivered in a way that still got me. What I wasn't expecting, though, is how well the movie would execute on other fronts, too. The ghost story at the movie's center ends up being more of a means to tell a story about sacrifice, friendship, and love. The real horror comes not from the ghost, but from the war that is drawing closer to the orphanage, and driving people to acts of desperation. I especially liked this line: "What is a ghost? A tragedy condemned to repeat itself time and again? An instant of pain, perhaps. Something dead which still seems to be alive. An emotion suspended in time. Like a blurred photograph. Like an insect trapped in amber." This was a great film to end the Evil Twins & Children block with. I give it four gold ingots out of five. I LOVED this movie when I saw it. I almost feel that it's not a horror film, but just a great coming of age/childhood story. Your project is making me realize how much I like Guillermo del Toro. Actually, I've atched movies he's produced but not diercted simply because his name is attached! ps: At some point, I will have to travel to LA to see what all the fuss is about without In N Out. You're right, it does have more of that feel to it. But you've got to admit, some of the ghost scenes are seriously creepy. I literally got goosebumps the first time it showed him underwater in that cistern. This month has raised my estimation of del Toro, too. I'm going to have to pull out some more of his stuff. (wiping in 'n out animal-style sauce from the corners of his mouth.) (...kyle, you just keep your dirty bird thoughts to yourself.) you know, del toro has co-written several vampire books with chuck hogan that i've heard good things about. and they're not presented as vamped up (get it?!) girl-meets-adolescence or boy-meets-boy greasy kid stuff; i'm looking at your twilight and true blood. i understand they're mean, toothbrush-challenged, down and dirty street-fightin', rail ridin' junkyard hobo style tails. which reminds me of a story from the set of John Carpenter's 1982 classic "The Thing." but i guess i'll save that for another time. Books? Those are for people without TVs, egghead. I'm interested in what you think of "ThanksKilling." It's quite a departure from a lot of the films you've been watching, but it's fun.